If you are familiar with the science fiction series Star Trek, you probably recall that one of the main subjects of the various TV series’ and movies was the prohibition against interfering with the internal development of alien civilizations. This was always referred to as “the prime directive”, a principle handed down by the fictional “United Federation of Planets”. As you may know or can imagine, this prohibition created various moral dilemmas (and interesting entertainment), as the various star ship crews traveled the universe “exploring strange new worlds” and “going where no man has gone before”. Not just any kind of disciple. Simply put, a disciple can be thought of as a person who is wholly committed to being trained through repetition, to adhere to some standard of thought which guides and impacts how they live every day of their lives. For example, a soldier in any branch of armed forces can be thought of as type of disciple. Another example would be a professional or Olympic athlete. In each case these are people who are committed to both the mental and physical training that impacts how they think, what they eat and drink, and where and when they travel. Go everywhere and preach the Gospel (The Gospel message of Jesus Christ and His Kingdom). Baptize those who believe in the name of the Father, of the Son and of the Holy Spirit. Reminding them that Jesus has been given all authority in heaven and earth (not just in heaven). Encouraging them that signs will accompany those Gospel proclaiming believers in accordance with what Jesus said as recorded Mark 16:15-18 and demonstrated and in the book of Acts and the Gospels. Encouraging them not to be fearful by reminding them that Jesus is with them until the end of the very end of the age. Commissioning them as Jesus did to repeat steps 1 to 3. This is a biblical summary of Jesus’ authorized process of what it means to both become and remain one of His disciples. 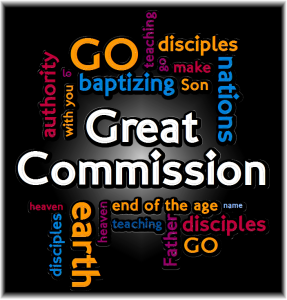 It is often referred to as ‘The Great Commission’. Missing the mark on any one of these points means that we are becoming or making some other kind of disciple, but not one of His. The Great Commission isn’t just for leaders in the Church. From this passage we can see that the fulfilling of the Great Commission is not just reserved for believing disciples who are ordained as leaders in the Church. The Church’s “prime directive” is Jesus’ Great Commission to disciple nations, not Star Trek’s principle of non-interference at all costs. The Church’s “prime directive” is the very antithesis of the hands off, non-interference principle of the Star Trek science fiction series. Unfortunately there are many professing Christians and ministries who follow the Star Trek principle. This idea might challenge us to our core, especially if we are only content with seeking out and attending good Church gatherings with good music, good sermons, and a good children’s ministry that don’t take us out of our comfort zones, equipping and encouraging us to actually “go”. Church gatherings with loving people and families who gather in Jesus’ name to hear good sermons and have good children’s ministry are not bad things to seek out. But all these things, when built on the foundation of the apostles and prophets, with Jesus Christ himself as the chief cornerstone, are intended to equip each of us in the Church to become spiritually mature believers (followers of Jesus who are being conformed to His image), that do the work of Jesus’ ministry (according to our gifting and calling), to fulfill the Great Commission wherever we may be right now or where God may have us in the future.